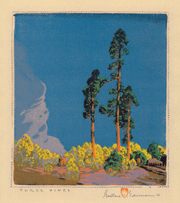 Three Pines - - 1925, Color Woodcut. Edition 50 printed in 1956. Signed, titled and dated 56 in pencil, with the artist’s hand-in-heart stamp. Numbered 21 in pencil, verso. A fine impresson, with brilliant, fresh colors, on buff laid paper; with full margins (2 to 3 1/8 inches), in excellent condition. 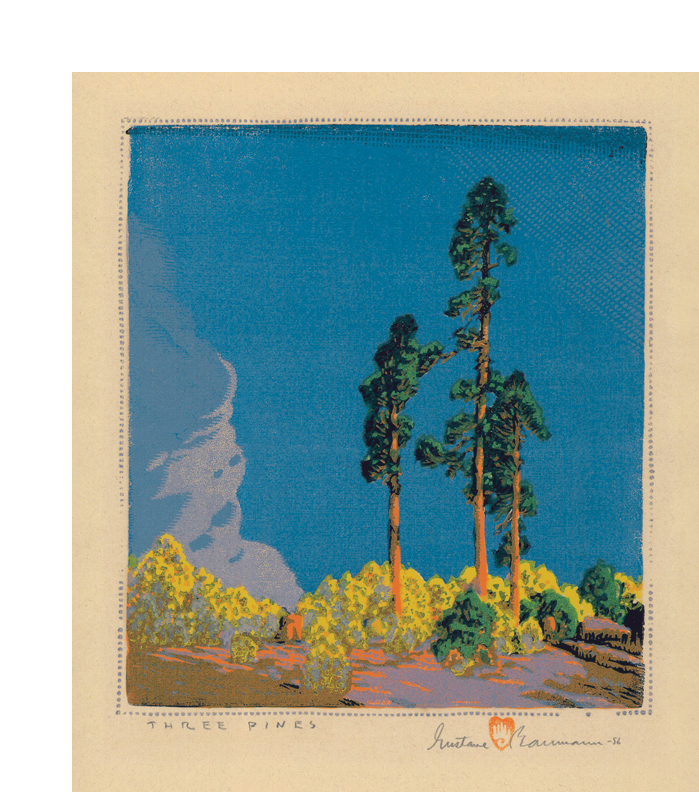 Inspired by a view at Estes Park, Three Pines is Baumann’s only woodcut of Colorado. 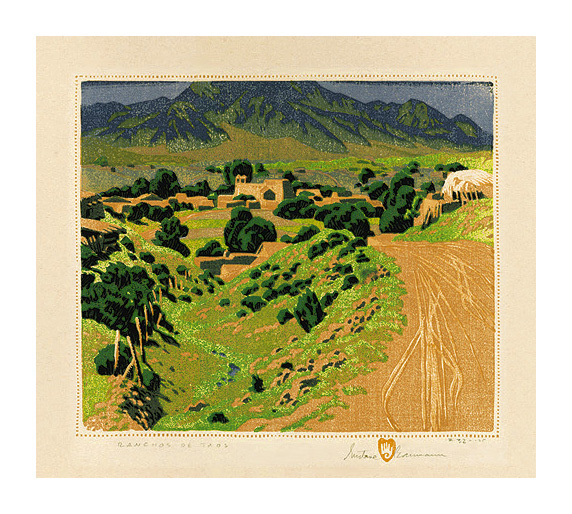 Ranchos De Taos - - c. 1925, Color Woodcut. Edition 125. Signed, titled and numbered #31-125 in pencil. Image size 9 5/8 x 11 1/4 inches (244 x 286 mm); sheet size 13 1/4 x 17 inches (337 x 432 mm). A fine, rich impression, with fresh colors, on fibrous oatmeal paper; wide to full margins (1 3/4 to 2 3/4 inches), in excellent condition. 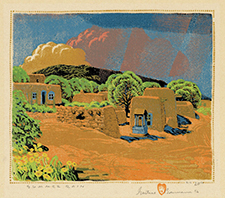 Summer Rain- - 1926, Color Woodcut. From the edition of 50 printed in 1956. Signed, titled, numbered RC 20-50 and dated 56 in pencil; with the artist’s hand-in-heart chop. Image size 9 3/8 x 11 1/8 inches (238 x 283 mm); sheet size 14 x 16 inches (356 x 406 mm). A fine impresson, with strong, fresh colors, on oatmeal wove paper; with wide margins (2 to 2 1/2 inches). Slight lightening of the paper within the original mat opening, otherwise in excellent condition. 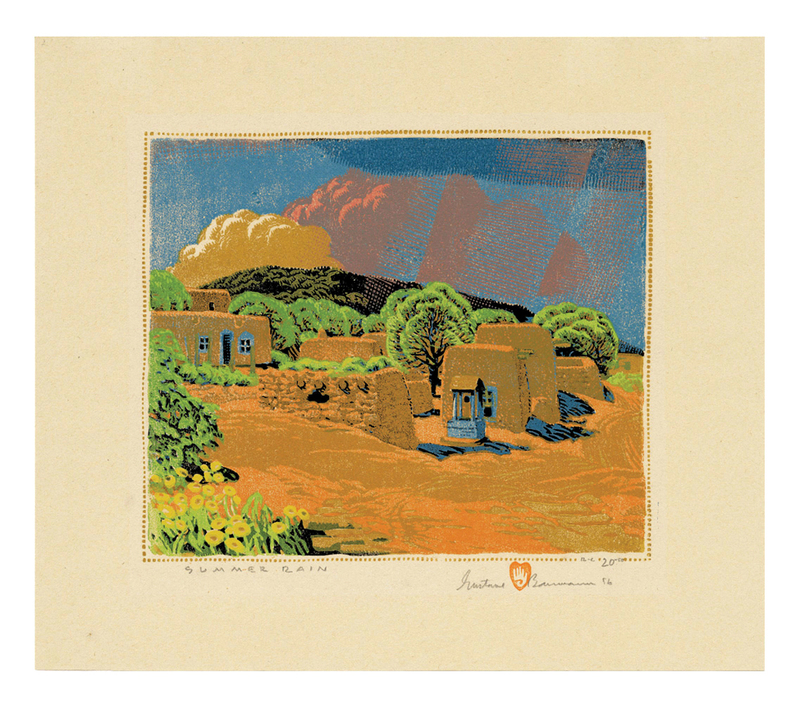 Reproduced: Gustave Baumann: Nearer to Art; Acton, Krause, Yuryseven; Museum of New Mexico, Santa Fe, 1993. 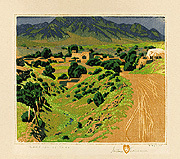 Exhibited: The Prints of Gustave Baumann, New Mexico Museum of Art, 2011. Collections: Davis Museum at Wellesley College, Indianapolis Museum of Art, Museum of Texas Tech University, New Mexico Museum of Art. 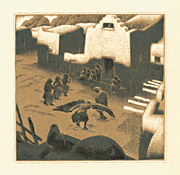 Eagle Ceremony at Tesque Pueblo - - 1932, Color Woodcut. Edition not stated. Signed GB, with the artist's chop, in the block, lower left. Image size 6 1/2 x 6 1/2 inches (165 x 165 mm); sheet size 10 1/2 x 8 1/4 inches (267 x 210 mm). A fine, rich impression, with fresh colors, on cream wove paper; full margins (3/4 to 2 1/2 inches), in excellent condition. 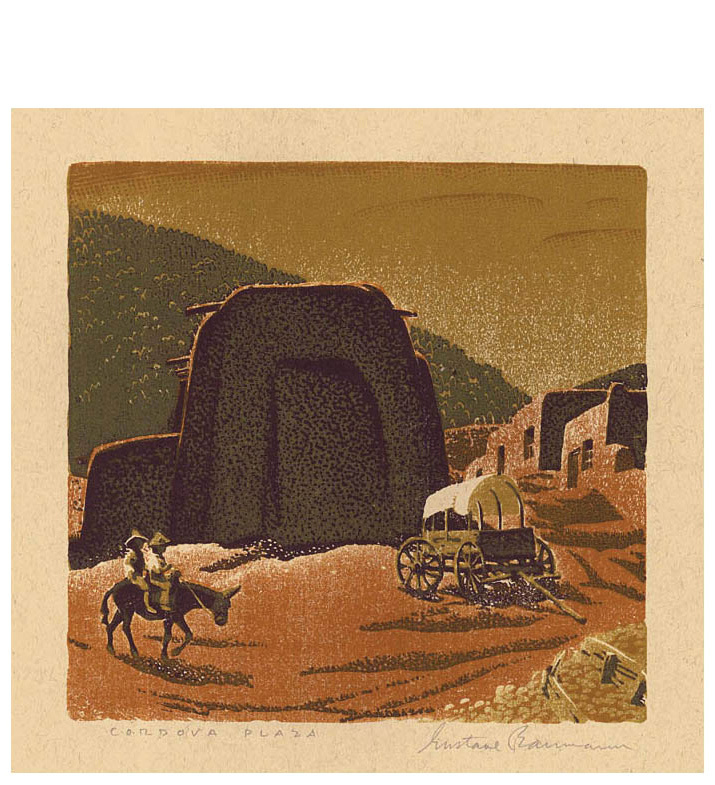 Cordova Plaza - - 1938, Color Woodcut. Edition 200. Signed and titled in pencil. Image size 7 13/16 x 7 15/16 inches (198 x 202 mm); sheet size 13 1/4 x 11 1/2 inches (337 x 292 mm). A fine impression, with fresh colors, on cream wove paper; full margins (1 5/8 to 3 1/4 inches); in excellent condition. 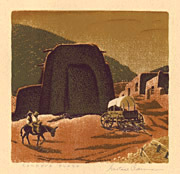 An impression from the edition published for the Presentation Print of the Woodcut Society, 1943. Printed by Torch Press, Cedar Rapids. 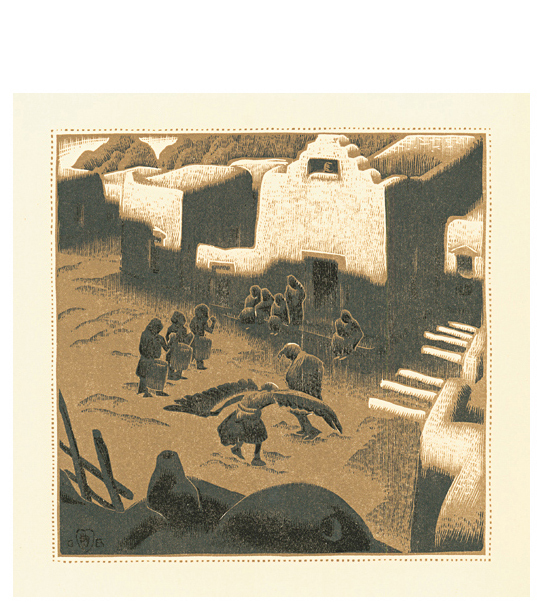 Complete in the original Woodcut Society letterpress presentation folder, with a forward by George William Eggers. Collections: University of Kansas Spencer Museum of Art; National Gallery of Art, Washington DC; Fine Arts Museum of San Francisco; Indianapolis Museum of Art.